Office workers spend the majority of their waking hours staring at screens. Unfortunately, few of us are aware of the visual biases and behavioral patterns that influence our thinking when we’re on our laptops, iPads, smartphones, or smartwatches. 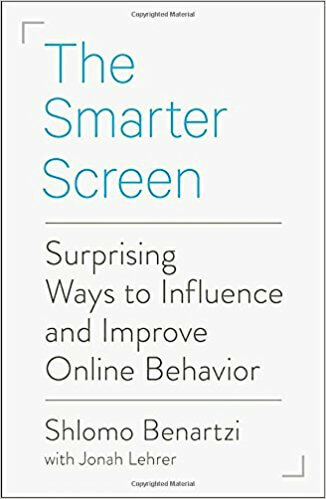 The sheer volume of information and choices available online, combined with the ease of tapping "buy," often make for poor decision making on screens.In The Smarter Screen, behavioral economist Shlomo Benartzi reveals a tool kit of interventions for the digital age. Using engaging reader exercises and provocative case studies, Benartzi shows how digital designs can influence our decision making on screens in all sorts of surprising ways. For example: • You’re more likely to add bacon to your pizza if you order online. • If you read this book on a screen, you’re less likely to remember its content. • You might buy an item just because it’s located in a screen hot spot, even if better options are available. • If you shop using a touch screen, you’ll probably overvalue the product you’re considering. • You’re more likely to remember a factoid like this one if it’s displayed in an ugly, difficult-to-read font. Drawing on the latest research on digital nudging, Benartzi reveals how we can create an online world that helps us think better, not worse.